Is it really worth it to use video to rock thought leadership? All executives know that they need a strong personal brand to help give a personal spin on the thought leadership they offer to their industries. But with so many hats to wear — meeting investors, managing budgets, and creating a vision and strategy for the future — it can be hard for C-Suiters to set aside even more time create awesome content. Believe me: The payoff for creating original and engaging video content is massive. I compiled this master list of people who are about to inspire your socks off! Across channels, these business pros are using video in their own way, and I hope these get you thinking about how to grow your audience with video! Let’s meet our incredible video-crushing execs, shall we? Pulling people from all corners of the Drift HQ, Mark Kilens goes face-to-camera, offering tips on how best to use their conversational marketing tool, company announcements, and sharing new job openings. Seemingly unscripted and set to a casual backdrop of employees working in their open space, the videos feel authentic and Mark elevates “co-host” employees as thought leaders. Quick takeaways, company culture, no fuss videos — check, check, and check! Lessons for Execs: Native LinkedIn Upload is your friend! Be sure to add captions to your videos though, so that viewers can enjoy your insight both with their sound on and switched off. Lastly, people crave authenticity! By offering some face-to-camera time and showing a behind-the-scenes glance of your office, you can invite people into your comfort zone. Susan Wojcicki is no video creating typhoon, but she has put out a few awesome “Creator Letters” over the past few quarters. These videos offer her take on what’s most recently gone down at YouTube and where the company is heading next. While she’s not stepping in front of the camera, Wojcicki uses her own voice to narrate the videos and give it that personal touch. She uses colorful animation to tell the story of where YouTube and its creator community have been, opportunities the YouTube team has noticed, and what they’re planning to build in the future. Lessons for Execs: Transparency from the top is such a valuable practice for executives to exercise. It shows users that feedback is shaping the product you’re working to build every day. But of course, you don’t need a professional animator to draw your company updates from scratch. Use CEO company announcement templates from video creation tools like Powtoon and add your own voiceover to accomplish the same effect in minutes! 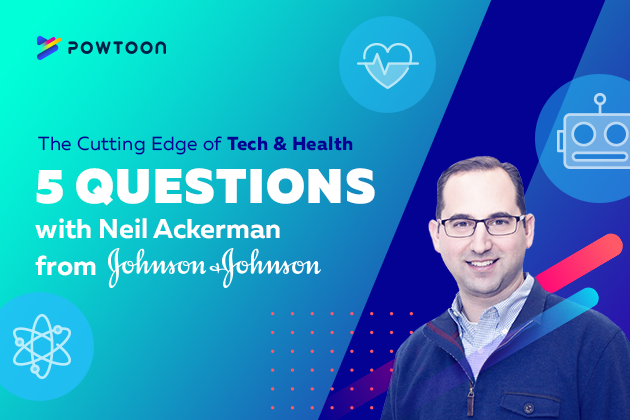 Unlike the first two picks that claimed their video thought leadership on their personal channels, Nic Beique, founder of Helcim, uses the company’s YouTube channel as his stage. He’s got a series on there called The Helcim Vlog that I’ve recently discovered and am totally digging. He covers everything from financial advice for small business, to company culture, and more. The small-yet-mighty FinTech company, based in Calgary, has gone all-out on this YouTube video series. They’ve got an adorable and ever-changing intro snippet, groovy background soundtracks, multiple camera angles to catch the perfect shots, and they aren’t afraid to use text overlays and merged media to keep viewers on their toes. Lessons for Execs: If you want to invest in a video thought leadership strategy that straddles polished edits, down-to-earth humor, and unforgettable content, make Nic and his team your North Star. Keep in mind though that no video series of this caliber can be built in a day. Do your homework to see what players you’d need to pull off a campaign like this. Shifting gears, it’s important not to forget about videos that take a minimum amount of effort. Caterina Fake, a serial entrepreneur at companies like Flickr and Etsy, started using Facebook video, not to publish new content, but to repurpose and distribute her podcast content. Fake’s new podcast, Should This Exist?, explores the commonly overlooked human side effects of AI. To help get the word out about new episodes, she marries soundbites of herself and her guests with simple visuals into videos. The goal? Rope viewers in and get them to click and listen to full episodes. Lessons for Execs: By far the simplest of video examples we’ve given so far, this kind of video content can inspire people to repurpose and redistribute their other content (be it audio or text) as a video to engage more potential viewers. As Caterina shows, a little effort can make a great impact. Utopia or Dystopia: Should This Exist? You’ve really Rip Van Winkled the past 40 years if you don’t know who Bill Gates is. That being said, not everyone is as familiar with the Microsoft founder’s wife Melinda Gates and their joint foundation, the Bill & Melinda Gates Foundation. The goal of the foundation is to improve healthcare and reduce extreme poverty around the world. Bill and Malinda don’t shy away from sharing videos natively on their LinkedIn accounts. What makes their videos stand out is the diversity in types of videos they produce. One day one will post a video on female goat nurses that are empowering women in India. Up next? An adorably prop-filled face-to-camera and stop motion video on the future of civilization. After that? A technicolor animation video about the power of phones and reproductive education. What’s more? A good old thought leadership interview with merged media. Lessons for Execs: Don’t feel like you’re tied down to a single form for video content. Creating a diverse tapestry of videos can help keep your audience engaged — never knowing what will come next. This approach also allows you to best exercise your creativity and storytelling techniques — which will shine through and be greatly appreciated by your viewers. Nicholas Thompson uses LinkedIn for his weekly segment “#MostInterestingThinginTech”. No shocker of a title and topic from the Editor in Chief of Wired, Nicholas talks face-to-camera about what tech news makes him excited, curious, and edgy. This no-frills video approach helps us step away from some of the more hi-tech (and high priced) videos we’ve seen in the past few listers. It’s super stripped down: one camera, one take, no words or objects zooming around the screen. Pretty approachable. What makes Nicholas’s series great is his consistency. He posts about twice a week, no matter what. Whether he’s sitting comfortably in his office at sunset or using his AirPods on the go, he makes sure that his take on the tech scene is shared. Lessons for Execs: You don’t need serious equipment to make videos with a serious following. Above all else, people crave consistency that builds trust and loyalty. As long as you can work up the nerve to talk passionately about what’s on your mind and do it on a regular basis, the people who appreciate what you have to say will find you. Known as one of the most senior women on Wall Street, there’s no doubt that Sallie Krawcheck’s video topic would be her speciality — finance. What makes Sally’s LinkedIn video series stand out is the countdown timer in the top left hand corner of her screen. That’s because Sally’s thought leadership is part of a segment she does for GZERO Media’s 60 Seconds. Lessons for Execs: While you might not get a fancy sponsor or big distribution partner, it’s a good idea to think ahead of how you will distribute your content if you want it to extend beyond your reach. Think about potential partners who will want to help share your video content with their audiences. We’ve been seeing a lot of funky video creators on this list, but Satya Nadella’s straight-shooter interviews are nothing to scoff at. As the CEO of Microsoft, Nadella can get any thought leader he wants to sit down with him. Nadella interviews top trailblazers who are moving the needle in spaces like education, automobiles, and healthcare. 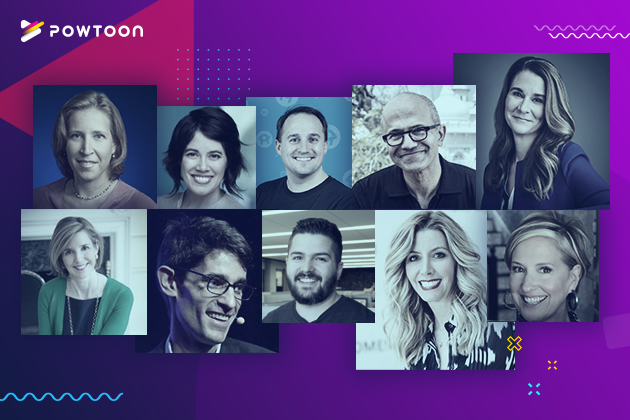 Focused on the cutting edge of innovation, Nadella doesn’t mess around with fancy swooshes and zooming effects, and gets straight to the point with his futuristic all-star roster of guests. Lessons for Execs: If you’re in a field that deserves video content that’s a little more straitlaced, respect the topics you’re addressing and the people who will be watching. If you’re looking to do an interview, regardless of the field, do your research to see who not only is leading in your space now, but those addressing some of the greatest challenges your audience will face in the years to come. Speaking of making the world a better place, Brené Brown, the CEO and founder of The Daring Way™ is using her platform to train helping professionals everywhere. What’s cool about Brené is her ability to creative video content that can be posted both on her Instagram and her LinkedIn. What’s unique to Brown is her warmth and approachability, not to mention the serene backdrops she’s always taking center stage in front of. And what’s even more heartwarming is what kinds of videos she makes. Many of her videos are Q&As of helping professionals; reading off challenges they’re facing and her offering kind and thoughtful answers to take way. Lessons for Execs: So often as executives, it can help easy to “understand” the challenges of your customers based on market research and fancy buyer personas. Why not ask you audience what challenges them? Create a simple face-to-camera video answering their questions, and they’ll be floored that you actually listened. Coming to Blakely’s Instagram page, she rocks showing off the balance between work, family, and fun that exemplified her brand. Her videos are consistently authentic and candid — fiercely modeling in her own life what it means to be a self-empowered woman. Needless to say female fans watching want in on her vibes, with the help of some Spanx of course. Lessons for Execs: Some C-Suiters like to keep their business persona and personal persona as separate as possible. For the faces and brains behind more consumer based products though, it might be worth considering how you can merge the two to tell a seamless lifestyle brand. Of course, if you don’t like sharing your life publicly, don’t! Be true to yourself, and your audience will thank you! As a primetime millennial, my mouth always watered as a kid sitting in front of the TV and seeing the Reese’s commercials. At the end of each ad, came the punchline you couldn’t help to say aloud along with the voiceover, “there’s no wrong way to eat a Reese’s.” The same goes for video creation. Know yourself. Know your audience. Know your industry. If we’ve learned anything from this post, it’s that there’s a million ways to slice a video to showcase your thought leadership and your company, so follow your heart and get shooting! Are there any executives you know that are making videos that we missed? Let me know in the comments below who you think should be lucky #11 and why they’re a video making inspiration to you!